When you meet Joy Stinger, you don’t forget it. 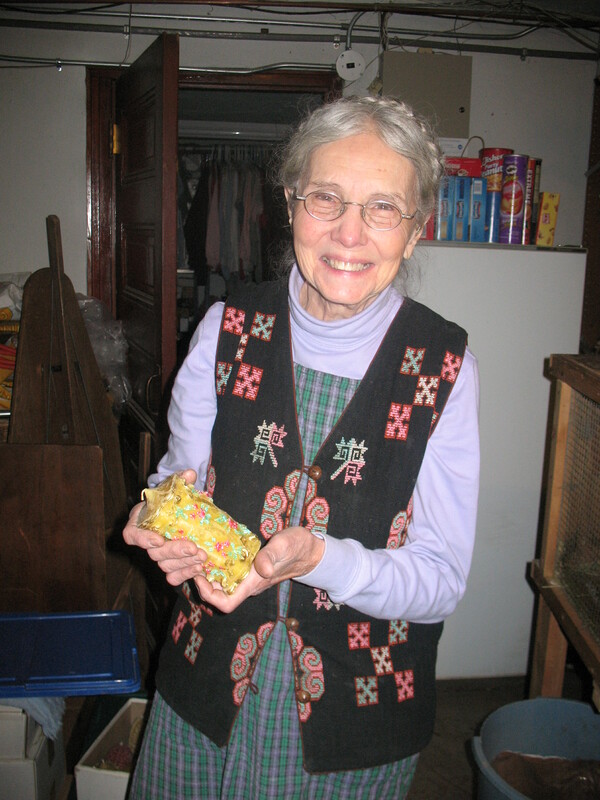 A bundle of energy, amazing honey, and beautiful candles all from a woman who personifies German grandma. Don’t ask me to explain that, it just makes sense to me. Anyway, I was excited to get the chance to visit Joy at her home this week. My son got dragged along too, but lucky for him this meant the chance to see chickens, hold a rabbit, see fish, cats, and two dogs. It’s like a petting zoo and Santa’s workshop in Clayton, Missouri. I visited Joy to buy some of her beautiful candles for the holidays. You’ll notice a photo of her pillars and one of her molds. 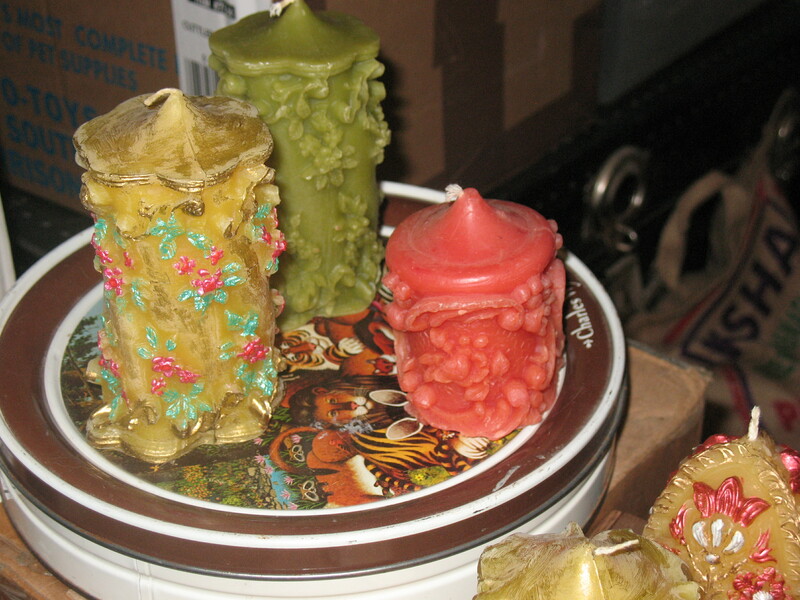 The candles are amazing and many are made with antique molds. 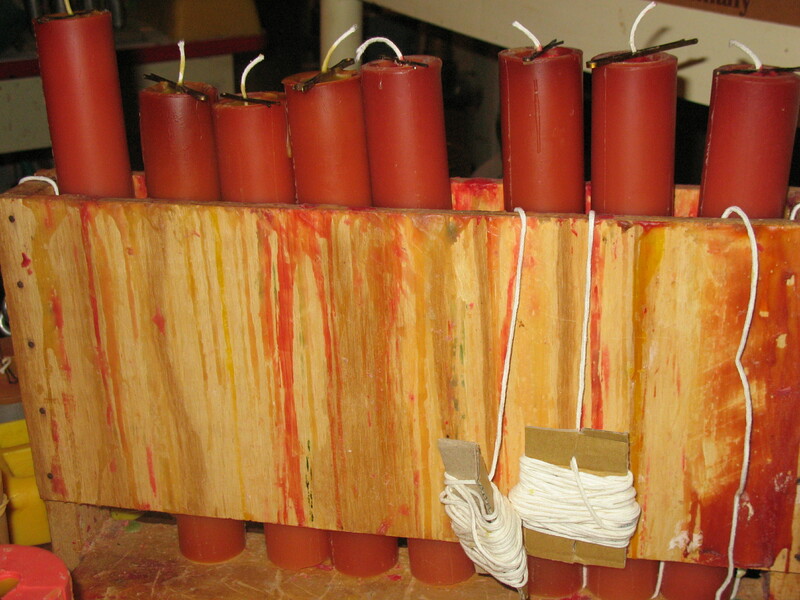 Joy also hand paints a lot of the candles which are made with beeswax and have the lovely aroma of honey. In addition to candles, I was able to get a peek into Joy’s world. 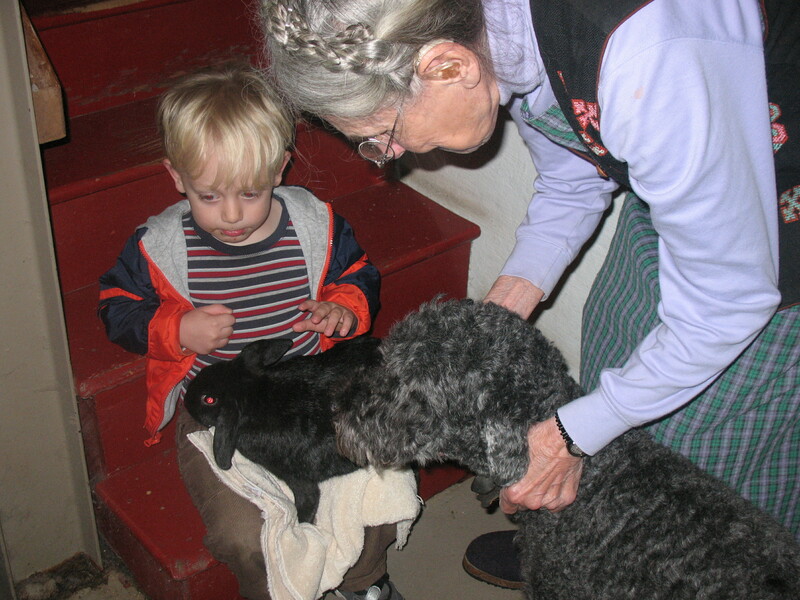 There is no shortage of animals to care for, candles to paint, molds to fill, eggs to gather…etc. Seriously I don’t know how she does it all. We have lots of her candles for sale at the store-tapers, pillars, pine cones, old-fashioned santas and small painted and unpainted ornaments. As quickly as they are selling I think I’ll be heading back to Clayton very soon. They’re back–lovely herbs and vegetable plants from Biver Farms. This year we’ve lowered the prices–$2.99 for herbs, $3.49 for vegetable plants. We are cheaper than Whole Foods! These plants are special because they are certified organic and because Biver Farms supplies us with many hard to find varieties–especially for tomatoes. This year you can even buy the Sun Gold cherry tomatoes to grow in your own garden. These fly off the shelves at our store and he can barely keep them in stock at Farmer’s Markets. These tomatoes are a beautiful and vibrant orange color with a taste that is so sweet you’ll eat them right off the vine. Local Harvest Grocery is excited to welcome Missouri Grass Fed Beef as a new vendor. You’ll find that this 100% grass fed beef is comparably priced, delicious, locally produced and we believe better for the environment and the animal. And, how great is it to be able to buy it right here in the City of St. Louis. No trip to the county is necessary. Please check out the information below to learn more about Missouri Grass Fed Beef. Jeremy, one of the farmers and owners, is very knowledgeable and a big believer in the importance of 100% grass fed beef, sustainable farming, and treating animals well. If you want to meet him yourself, he will be at the Maplewood Farmer’s Market this year. The meat arrives on March 26th so we hope to see you soon! We forbid any growth hormones, steroids, or antibiotics to be given to our cattle so that our customers can be assured of receiving pure, healthy beef the way nature intended. The beef we sell has been born and raised on the same farm from start to finish. They are processed at less than 1 year of age which results in the leanest, most tender grass fed beef available. They have never been fed any grain or animal by-products(standard practice at commercial feed lots) and have only had grass, legumes, mother’s milk, and free choice minerals. Our family has been in the cattle business since 1945 and we have seen many changes in farming and ranching throughout the decades. One thing that has not changed is our commitment to the land and to our animals. We keep our land healthy and productive by utilizing a rotational grazing system. This insures that our cattle are taking in the highest quality protein. Craving the taste of Mangia but can’t be bothered to step out of your house. Well, next time you’re at Local Harvest I highly suggest you grab one of the new products we’re carrying from Mangia–Pesto and Pasta Sauce. A few nights ago I enjoyed the pesto with some of the fresh Radiatorre from Mangia. It was sooo delicious. The pesto was just right–not too oily and full of basil and garlic. Made me think of summer time. Oh yeah, and don’t forget that we carry a variety of fresh pasta from Mangia and the selections change weekly. A new one I had the other day was a beet fettuccine and it was delightful. The flavor was a little earthy and color was a nice light fuschia. The pasta does not taste like beets which made my husband very happy.